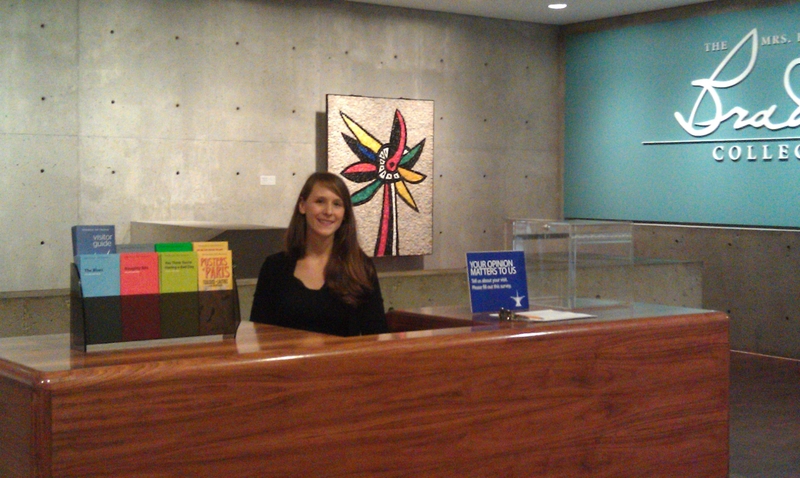 Volunteer Program Intern Gwen working at the Kahler Information Desk. Photo by Nell Rae. Sometimes, when I feel overwhelmed or lost in my own career trajectory, I remind myself that I have paid some serious dues to get my sensibly-heeled foot in the door of the museum world. I licked envelopes at the Hudgens Center for the Arts in Georgia when I was a moody, but somewhat artistic high school junior. Soon after I interned at the High Museum of Art in Atlanta, where my duties included tasks for registrar Frances Francis and helping with family programming for H. Nickels B. Clark (apologies if I have gotten the spellings wrong- it was a LONG time ago). Another great internship followed the High Museum, I got to work at the Musée du Petit Palais in Geneva, Switzerland while studying abroad. My memories are vague–did I really try to translate French visitor guides into English using my remedial high school language skills? Did I really try to help conserve Karl Gotsch artworks by carefully moving works on paper off of acidic mats to prevent horrible speckling? One thing sticks: My friends were doing political internships at NGOs, curing cancer, and saving the world, but I felt just as meaningful working with art all day in one of the most incredible cities in the world. What I mean to say about my internships is that they changed my life, and I know I’m not alone. Only now can I really truly say how very very grateful I am for the wisdom, experience, and patience of the people who let me come into their workplaces and do random tasks (sometimes poorly). Because, I can honestly say I would never have my current role as Director of Visitor Services at the Milwaukee Art Museum had it not been for those formative experiences working inside museums. 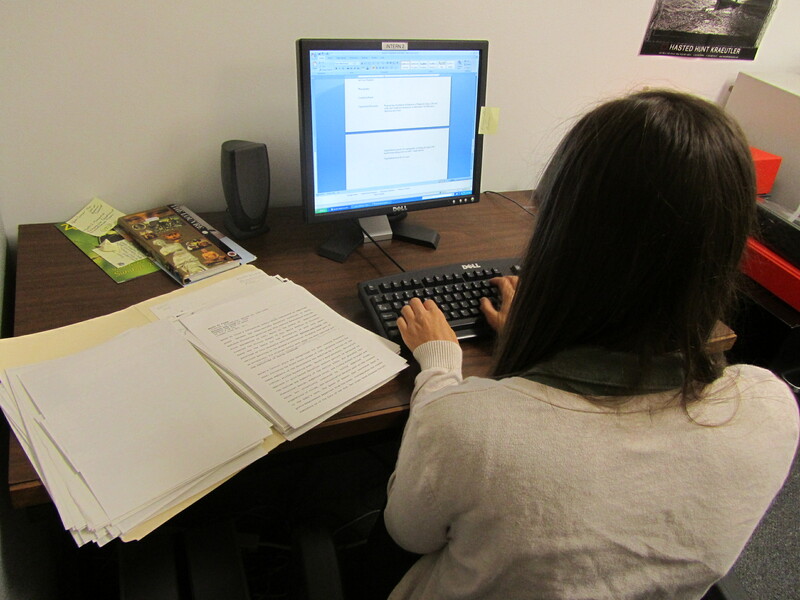 Curatorial intern Katie LoDuca works on European art research. Photo by Mel Buchanan. Internships can be paid and unpaid; they can take a variety of forms. You might find yourself doing tasks that no one else has time to do and you might ask a million stupid questions. But, you will learn things and you will become a better person. And maybe you even earn your keep! I’ve had the honor of supervising two exceptional interns, both of them were overqualified to work for free for the Milwaukee Art Museum. And both of them made my life more difficult. 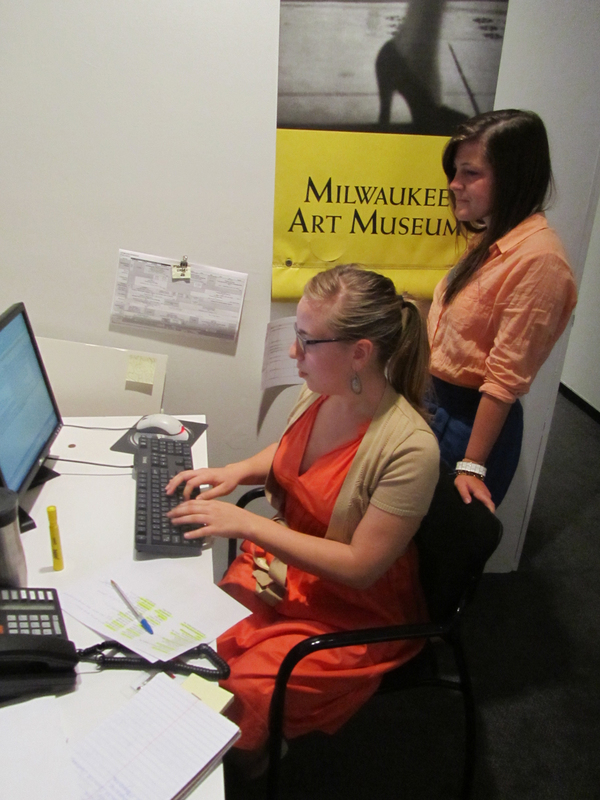 Marketing interns Kelly Mulligan and Nina Luedtke work together monitoring museum “Google Alerts”. Photo by Mel Buchanan. Ann Marie showed up in Milwaukee with an incredible resume. I needed her help desperately because the Museum lost a full time volunteer coordinator position in the budget challenges of 2008. I was brand new in my job and already had my share of “fires” to address. During her internship, Ann Marie supervised volunteers when I didn’t have time–she scheduled them, she listened to them, coached them, researched the Patron’s Edge’s volunteer module, and did a million other thankless tasks to keep the program intact. Her work essentially guaranteed that the Museum kept a strong and positive relationship with a corp of dedicated volunteers that are necessary for us to serve the visitors. Ann Marie also raised questions that I literally could not answer, and her smarts kept me up at night. Where is Ann Marie now? She is a campaign associate at the United Way for Greater Milwaukee. I like to think that Ann Marie’s unpaid internship helped her get the career she deserves, but the truth is she selflessly applied all of her skills for free to the Milwaukee Art Museum on her path. For the Museum, and now for United Way, she made a world of difference and continues to do so. Another intern I have supervised is Nell Rae. Nell Rae applied for a Museum internship at the same time as Ann Marie; and I must admit that I did not select her the first time around. She seemed too green, too eager, and not quite ready. I laugh about my perception now, because I was proven wrong that she was “not quite ready” when Nell Rae instead volunteered for the Museum, became an intern, trained as a Museum docent, and was soon employed as the Milwaukee Art Museum’s Volunteer Coordinator. She is passionate, she has big ideas, and she is extremely hard for me to supervise. Nell Rae is hungry to take on the world and to better the Museum. While she is reporting to me (and I know that she’ll rocket higher soon enough! ), I have to help prioritize her efforts, set clear goals, and hold her accountable for meeting the business needs of the Museum. Reigning in her enthusiasm means I have to say no to her a lot.But that is my job to keep practical and on budget. In middle management, it’s hard to juggle miniscule details like typos on signage as well as Nell Rae’s blue sky thinking. Rachel Vander Weit started as a Museum intern in 2002, and is now Curatorial Assistant working with the Museum’s Chief Curator. Photo by Mel Buchanan. Those are a few of my personal stories of interns and their successes, and I know my colleagues have any more. For instance, Rachel Vander Weit (above) began as a Milwaukee Art Museum intern while a University of Wisconsin-Milwaukee undergrad in 2002, she worked in several positions (including the assistant for the Contemporary Art Auction) and is now curatorial assistant working for the Museum’s Chief Curator Brady Roberts. Do everything you can to help. Know when to stay out of the way. Set a limit for yourself on when your internship will end. Keep your ears alert. You’ll learn a lot by what you hear. Choose your interns wisely; follow your instincts. Give them autonomy, but don’t waste their time. Be prepared for the fact that they will turn into your colleagues (or your future supervisor). Don’t feel too guilty about not paying them. There is value in experience. Network with colleagues in other organizations to learn best practices. Work with your Human Resources department and be ethical. For more information about becoming an intern, and current openings, at the Milwaukee Art Museum, visit the internships page on the Museum website. 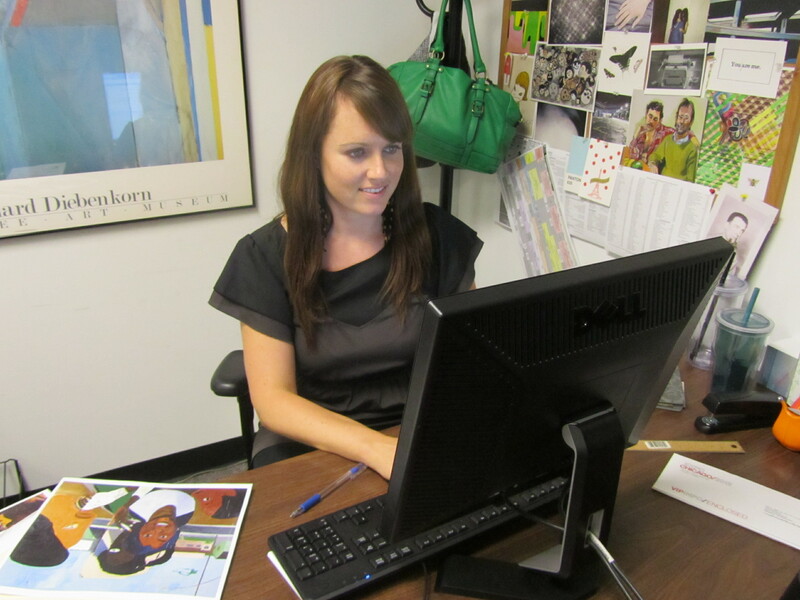 Here is a first-person perspective from Jessica Janzer about her teen internship. Here for Janet Gourley’s memories of working as an intern on the “Summer of China” years before the exhibition. Here Catherine Sawinski details 10 years of working with more than 100 Museum curatorial interns. This entry was posted in Art, Behind the Scenes and tagged Interns, visitor experience, Visitor Services. Bookmark the permalink. Thanks to AMM, Mel B, Rachel VW, NRF, Gwen, Katie LoDuca, and BK for inspiring this post. Also, Frances Francis and Lucy Elliott and JEM. Interns rule.